There are between six and seven thousand languages which are used by around seven billion people, divided into 190 independent states. There are around 230 native languages in Europe. Most of the world languages are spoken in Asia and Africa. There are between six and seven thousand languages which are used by around seven billion people, divided into 190 independent states. There are around 230 native languages in Europe. Most of the world languages are spoken in Asia and Africa. At least one half of the world population is bilingual or multilingual and speaks two or more languages. People use a few hundred words for everyday conversations. Languages are constantly connected with each other and influence one another in various ways. English expressions were taken from many other languages in the past, while nowadays European languages are borrowing many words from English language. In its first year, a child utters a wide range of voices and sounds. Around its first year, a child pronounces its first intelligible words, and around its third year a child can form complex sentences. In its fifth year, a child possesses a few thousand words. Mother tongue is usually a language that everyone knows the best and speaks the most. There are people who speak two languages equally good, but do not show a perfect balance between the two languages. Bilingualism carries a lot of advantages. This makes learning additional languages much easier, expands the thinking process and fosters contacts with other people and their diverse cultures. Bilingualism and multilingualism can cause economic advantages. 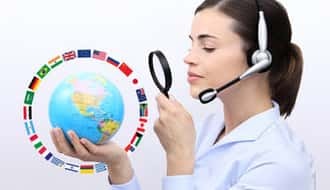 Jobs are easily accessible to the people who speak several languages, while multilingual companies have a better competitive advantage than the monolingual ones. More and more Europeans are faced with foreign languages in their everyday life. There is a need for creating a greater interest for languages among European citizens. Many languages have over fifty thousand words or more, but individuals usually know and use only one portion of the entire vocabulary. The languages are related to each other as family members. Most European languages belong to three large groups: Germanic, Slavic and Romance. The Germanic group of languages includes the following ones: Norwegian, Danish, Swedish, Icelandic, German, Dutch, English languages, etc. Romance languages are: Italian, French, Spanish, Portuguese, Romanian, etc. Slavic languages include: Russian, Ukrainian, Polish, Belarusian, Czech, Slovak, Slovenian, Serbian, Croatian, Macedonian, Bulgarian, etc. Most European languages use Latin script. Some Slavic languages use the Cyrillic script, such as Serbian. Greek, Armenian and Georgian have their own script. Most European countries have a number of minority and regional languages. Some of them have gained an official status in the countries in which they are used.